One hundred forty-six volunteers were randomized to receive a placebo or an allicin-containing garlic supplement, one capsule daily, over a 12-week period between November and February. They used a five-point scale to assess their health and recorded any common cold infections and symptoms in a daily diary. The active-treatment group had significantly fewer colds than the placebo group (24 vs 65, P.001). The placebo group, in contrast, recorded significantly more days challenged virally (366 vs 111, P.005) and a significantly longer duration of symptoms (5.01 vs 1.52 days, P .001). Consequently, volunteers in the active group were less likely to get a cold and recovered faster if infected. Volunteers taking placebo were much more likely to get more than one cold over the treatment period. 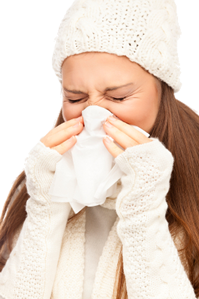 An allicin-containing supplement can prevent attack by the common cold virus. The common cold is the world's most widespread viral infection, with most people suffering approximately two to five colds per year. Over 200 different viruses cause infection and cold symptoms; the most common, rhinoviruses, account for 30% to 40% of adult colds. Re infection is prevalent because of this wide variety of infectious viruses. 1 Published literature on the activity of garlic against viral infections is sparse. 2,3 One report 4 describes that during an influenza epidemic.